Scoping the fed scene for the best match to apply your very formidable skillset? 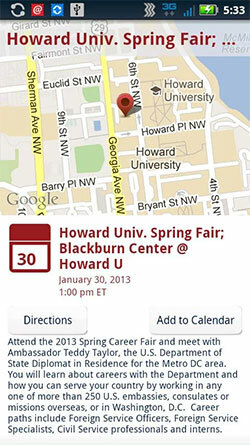 Use your smartphone to cast a wider net on your job search with help from the USA.gov Federal Mobile Apps Directory. While you may be familiar with the USAJobs mobile app for iOS and Android, did you know about the IRS jobs mobile website that runs on the USAJobs platform? 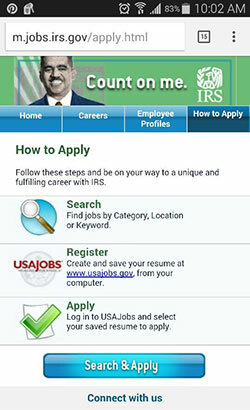 The IRS mobile website allows you to both search and apply for IRS jobs. While you’re at it, check out the Department of State’s DOSCareers app, available for iOS and Android tablet and mobile devices. This official app is designed to educate people interested in careers in American diplomacy, and helps the public discover what it’s all about. And don’t forget the Department of Justice Law Jobs app, currently available for iPhones. Use this app to quickly find attorney jobs and legal internships within the Justice Department. Have another federal job search app? Let me know about it in the comments, and include why you love it.You can download these and other cool mobile government apps with just a few clicks from our USA.gov Federal Mobile Apps Directory. Federal agencies can get their apps in the directory by using the Federal Mobile Products Registry.